The six of us rode down from Oslo; i.e. 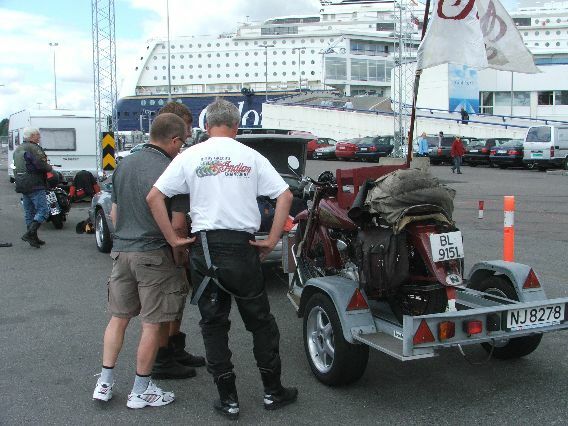 we went by ferry from Oslo to Kiel, then we had a nice drive down to Hamburg where we boarded the “Autozug”, a train set up to transport cars, bikes and people fast and efficently. The next morning we woke up the city of Lörrach in the south west part of Germany near the french/swiss borders. 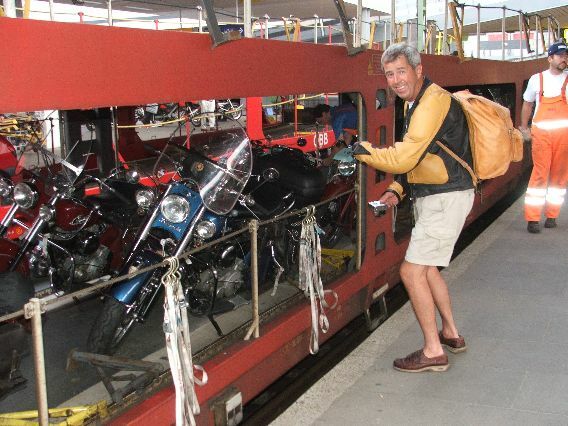 The bikes had to be ridden off the train, which was quite a feat with cold engines and foot clutches. We soon set off for some highter country as we rode into the beautiful hills of Schwarzwald (“Black Forest”). 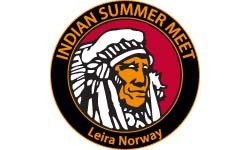 The temperature was high, more than 30 degrees Centigrades and the Indians had a hot day but managed well. After having ridden the lovely Schwarzwalder Hochstrasse which is a favourite route for local bikers we came down to the city of Baden-Baden where we were welcomed by a German Indian rider living in Baden-baden; Klaus W. We were received with cold beers and a tour of his garage which contained a very nice 39 Chief, a hefty 101 and a meticulously restored 841 in full military trim. After a night out on the town enjoying traditional German food and lots of Weissbier and a local schnaps based on pears we finally hit the pillow at the same moment as a heavy thunder and lightning and rain filled the air. Next morning the weather was a bit cloudy. 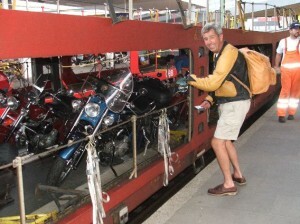 After breakfast at our hotel we strolled over to Klaus where our bikes were parked . Klaus was preparing his Chief while his son and wife packed up their modern bikes to go to the rally. 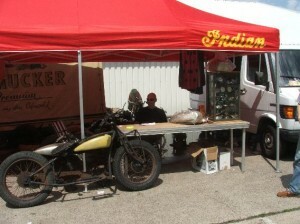 At noon we heard the distant thunder of Indian twins, and seconds later Jürgen Hecker rode in through Klaus’ Iron gate on his lovely original condition 101 accompanied by two friends on 101’s as well, and Jim Parker from Melbourne and of VI fame on a Blue late thirties Chief with sidecar that he had borrowed. 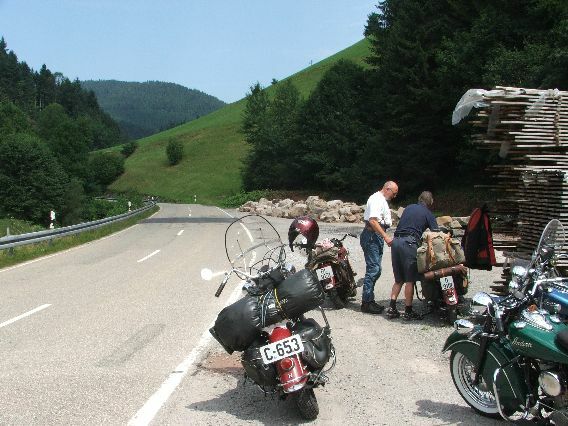 They had spent the morning riding over the Schwarzwalder Hochstrasse and Jim was obviously excited about the roads, albeit slightly on the boil, as the air was damp and hot. We arrived in Speyer in the early afternoon and were greeted by the German organizers, which names I only faintly remember by now. Mathias Elvenkämper was quite visible though as we were welcomed with warm greetings and security armbands with our indian’s registration numbers on. At that point we only had three issues on our agenda: 1: Aquavit; 2: Cold German beer (XL size) 3; raising the tents. On Friday evening we had some nice bratwursts and pommes inside the huge combined diner and ballroom and even more beers. We had some heavy rain Friday night, but that did not disturb the conversations inside as we met still more old friends from previous rallies. On Saturday morning we had the opportunity to check out the essential technical facilities of the rally site. We were very pleased to find freshly cleaned toilets and showers with lots of hot water. Ten points from the Norwegian jury!Approx half the rally participants went for the Saturday morning ride on their bikes, and those who rode reported back on some very nice scenery, but many hot Indians due to the vast number of traffic lights on A roads in this part of Germany.We skipped the ride, had another cold German beer and strolled over to the museum adjacent to the rally site. 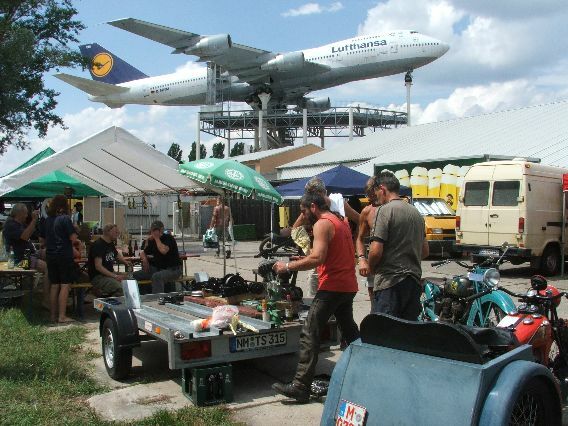 The rally site was located on the grounds of the Speyer Technic Museum, which in its turn is located on a former German military airstrip with concrete runways. We learnt in the museum that this airfield had been the homebase of Messerschmitts from the 52. jagdgeschwader (fighter squadron) from may 1940, with pilots seeing much action on the Eastern front. Inside the old hangars which served as exhibition space there was a vast collection of technical oddities and obsolete vehicles and contraptions. Among them was an Me 109 Messerschmitt that had Speyer as its base when it crashed on the Eastern front. It was rescued in the nineties and restored to absolute perfect condition in Italy. It looked really ready for take off, with the left side of the engine bay open to reveal a very tidy engine compartment. A few yards away we found a Messerschmitt Rollerkabin three wheel motorcycle-car from the fifties, illustrating how German industry tried to find new markets post war. Interestingly there are several design features on these small three wheelers that are nostalgic mirror reflections of the ME 109. On a giant steel scaffold in open air a huge Airbus was posing a take-off. Visitors could climb the stairs to walk around in the interior of the plane, which had been dismantled inside so you could study all layers and structures, from the carpets to the inside of the fuselage and the strong frame members. Interesting and quite scary to stand in the extreme rear part of the plane and feel that one thud with your foot on the floor made the plane flex and oscillate just a wee bit. But, flexibilty means strength in this setting I have been told. Many of the dealers were at the rally to, as you can see from the pictures we had a veritable shopping mall to do business in, with Leenes, Pelders, Brakel, Mattern, Timmermann etc etc.We missed Moen and Alan Forbes though. It is amazing how rare original stuff continue to turn up in 2005, and the quality of repro parts is mostly very high these days, making the maintenance of your Indian easier than ever. In the evening we all gathered in the diner/ballroom again for some more food, wine and beer and the odd drink of aquavit. Prizes were handed out in many classes. 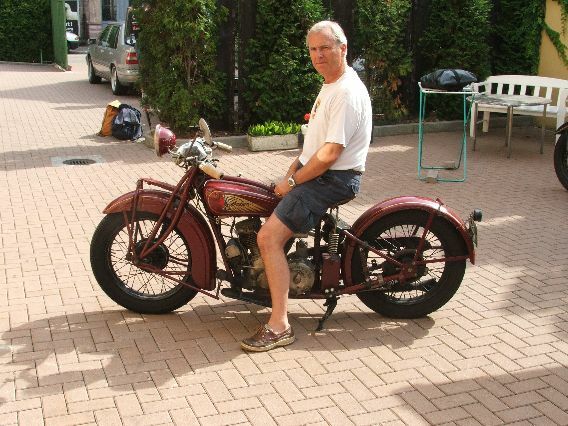 Our co-rider Lars was very proud to bring home the “Best twin” trophy, awarded to him for his original paint 1936 Chief, a strong rider which he bought in 1961 and has owned since. 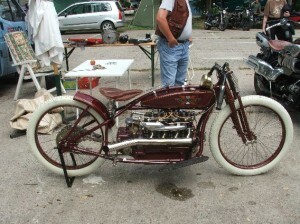 As can be seen in the rally pics at the Norwegian Indian club homepage there were quite a few specials there as well. You will find a modified/reconstructed velodrome pace bike and a very special 5 cylinder AUDI based motorcycle as well as a hefty (indian) red Henderson four in racing trim. 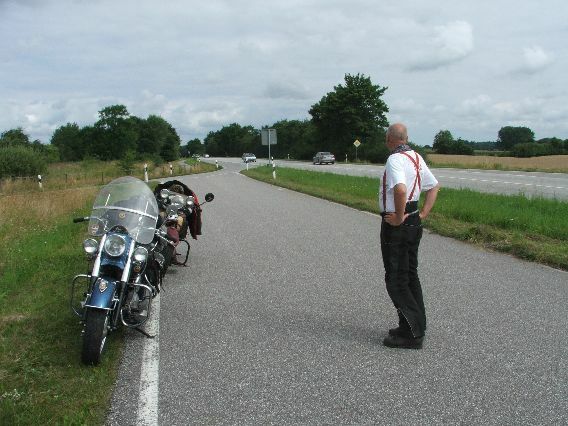 The Norwegian delegation returned to Lörrach on Sunday morning to reach the Autozug back to Hamburg Altona. From there we rode on the Autobahn to Puttgarten, then by ferry to Rödbyhavn in Denmark, the Motorway from there to Copenhagen to reach the ferry to Oslo, which we missed due to a rear tire puncture on a 34 SS and a loose electrical connection on my 53-ish Chief.We then drove quite fast the 70 miles from Copenhagen to Helsingør in Sweden across the Öresund bridge, and managed to ride on board the ferry at its pit stop in Helsingör. After having our heart rates come down to below 150 again we ordered a beer in the ships pub before we had a lovely three course dinner with champagne with the moussle soup and a very nice Chianti with the main course mouton. A grand finale to a great ride to a very well organized rally! Next morning as we disembarked the ferry in Oslo the weather was bad with heavy rain and the realities of life (work) became disgustingly close at once.